At the interface of social, earth and life sciences, the CNRS Institute of Ecology and Environment (INEE) has developed an integrative approach to environmental sciences that aims to promote global ecology at every scale of time and space. INEE is a fundamental research institute that combines research with action, and contributes to the advancement of knowledge for sustainable development. INEE's mission is to bring the environmental sciences to the fore as an integrated scientific field. Its goals are to promote creativity and undertake fundamental research of excellence, and to set up and develop innovative tools in global ecology through the development of partnerships. Research is carried out by a network of laboratories in the fields of evolutionary science, biodiversity, ecology and human-environment interactions. INEE is an interdisciplinary institute that plays a central role in the environmental sciences by integrating issues associated with the biological sciences, geosciences and social sciences. The Institute mobilizes a community of scientists from a variety of disciplines, and coordinates a wide range of interdisciplinary research into terrestrial and marine ecosystems and environments. INEE is highly active at the international level and takes part in the European Research Area. The Institute collaborates with teams on every continent, especially in biodiversity hotspots in Africa, Asia and Oceania. Its commitment to research in French Guiana has enabled it to build strong relationships in South America, with Brazil in particular. 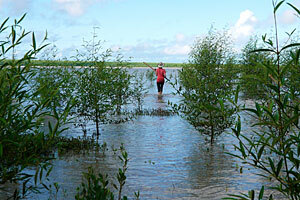 Avicennia mangrove forest, in an experimental plot located in French Guiana's Sinnamary estuary. functional ecology, analysis and management of ecosystem services. 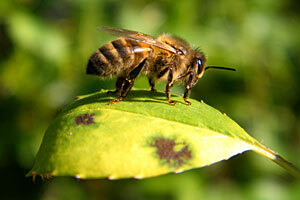 Apis mellifera honey bee (Laboratoire microorganismes : génome et environnement, à Clermont-Ferrand).